This pie chart immediately below shows that there are a significant number of wells (drilled and not yet producing) that should be coming online and into production in the coming months. Also note the large number of wells that are "permitted" only. In the last three months alone (comparing November 16, 2013 Ohio DNR report to the August 17, 2013 report, producing wells went from 125 to 184. Drilled wells (not yet producing) went from 301 to 338. Wells classified as permitted only, went from 335 to 382. Total wells went from 840 to 988. 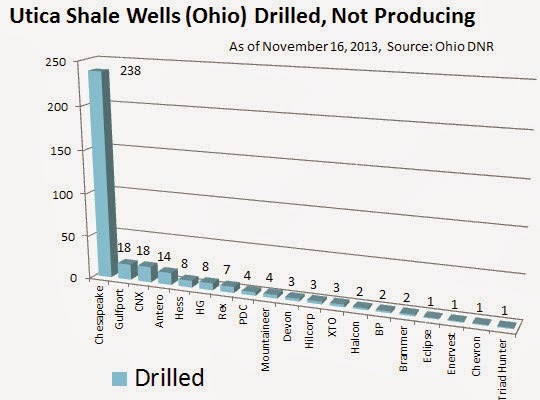 Other charts below show that Chesapeake leads in wells producing, drilled, and drilling, followed by Gulfport. HESS has more wells producing than Antero, but Antero is currently more actively drilling and has more wells drilled and awaiting production status. 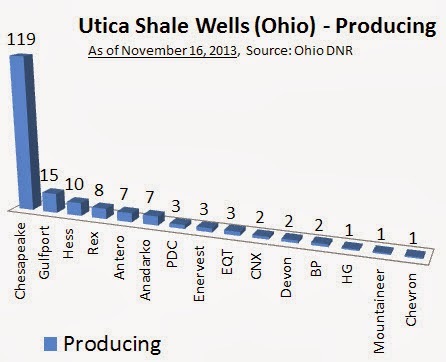 As a result, Antero should soon pass HESS in total wells producing. Note that once wells are drilled, there is typically a 30 to 90 days rest period before taking wells into production. The rest period allows for the dissipation of water and frac fluid. A lesser rest period is typically associated with wet gas wells and a longer rest period is associated with more oil rich wells. Visit the "Maps" tab on the top of this Web page in order to view, filter, and plot the location of any wells by operator, status, county, township, and more. If you love Maps and data then I have a treat for you. By using the "Filter" option in the upper left side of the Map Here, you can create one filter and add even more filters to quickly and easily answer questions and then display those answers on a map. IMPORTANT NOTE: In order to access and filter on the latest maps available, go to http://www.uticashaleblog.com/p/maps.html and select the "Click to view LARGE Map" link under the first map listed. These maps are updated about twice each month. The process is relatively simple and the familiarity and ease of Google Maps makes it appealing. The basic idea is to select and stack filters. For example, suppose that you want to know what Ohio county received the most permit applications from June 1st 2013 to August 17 2013 and what companies were issued the permits. First select the time range. Go to the Filter selection at the top left of the map, select "Permit Issued", use the calendar to set the date range from June 1 to August 17 2013, and then you have a nice map of wells from this time frame only. Next, go back to the "Filter" option and add "County" where you will see that "Carrol" county had the most permits issued at 50, followed by Harrison at 29 and Belmont at 24. Now, select the check box next to Carrol county to see those wells only, next select "Operator" to see that Chesapeake accounted for 45 of those permits and R. E. (Rex Energy) accounted for the remaining 5. You can even drill deeper to determine the status of just the 50 wells permitted since June. To do this you simply add another Filter, "Status", where you will see 4 of the 50 wells drilling. Now select the check box next to "Drilling" and you will see 4 Chesapeake wells. Question: Which county has the most number of wells currently classified as drilling? Answer: Harrison with 18, followed by Belmont with 15 and Carroll and Noble each with 11. Question: Who is the most active operator now drilling in Harrison County? Answer: Gulfport Energy with 8 and Chesapeake and Hess with 5 each. Question: Where has BP permitted wells and what is the current status of the wells? Answer: Trumbull County with 4 wells total. 2 drilling, 1 drilled and 1 permitted only. Question: Who is the most active Driller at the moment? Answer: Gulfport has 22 wells classified with Status=Drilling, followed by Chesapeake with 18, Antero with 8, Hess and HG at 6, followed by many others. Use the "X" next to any filter to remove that filter and create a new filter. Give it a try, see what insights you can discover, Create Your Own Map and Filters. IMPORTANT NOTE: In order to access and filter on the latest maps available, go to http://www.uticashaleblog.com/p/maps.html and select the "Click to view LARGE Map" link under the first map listed. These maps are updated about twice each month. Enjoy. 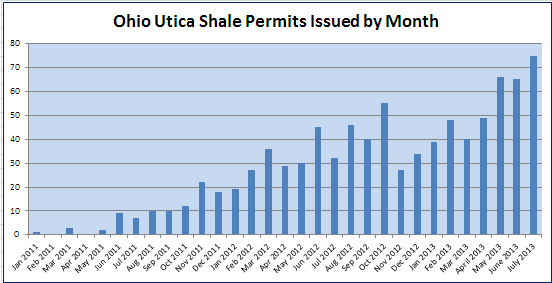 Utica Shale Ohio Permit Activity at New High, Wells Drilling Also Up. The total number of Ohio Utica/Point Pleasant permits issued in July 2013 hit an all time monthly high at 75. 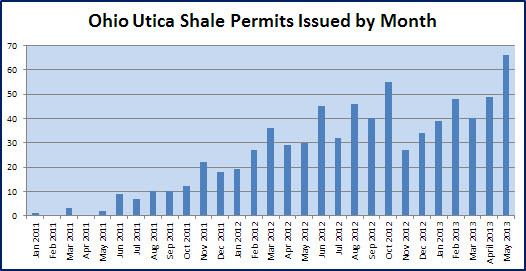 Year over Year, the fist seven months of 2012 saw 218 permits issued vs. 382 permits issued through July of this year. A map of July permits issued can be found here. In addition, the August 17 report showed a total of 52 wells classified as "drilling", a big jump from the mere 12 wells classified as "drilling" back on May 25th of this year. A map of those well given the status of drilling can also be found by visiting the maps page. A relatively narrow and focused SW to NE band still still looks to be in place, identifying where most believe that profits will be higher and risk lessened. At about six to eight million needed to drill, produce, and complete each well, you can be sure that great care is taken to stay in the most profitable zones, or at least where those zones are believed to be with the least amount of uncertainty. Of course other factors go into deciding where to drill, including proximity to infrastructure, though profitable amounts of hydrocarbons in place and the ability to bring that hydrocarbon to the surface is paramount, as well as tapping into a hydrocarbon that favors liquids over gas. It seems like there is no stopping the Utica. Good news for those in the SW to NE trend. And it is still early days so we can expect some cautious expansion into higher risk areas, especially if or when natural gas prices rise. 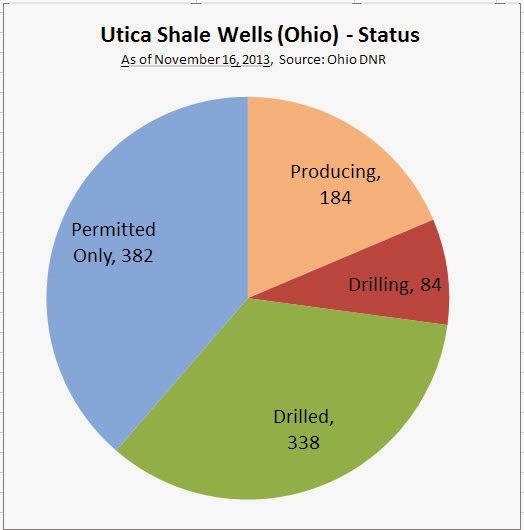 The latest Ohio Utica Shale Report out of the DNR shows 52 wells drilling, up sharply from the middle of June the number of wells classified as "drilling" stood a 14. Most notably, Chesapeake is back drilling with 15 wells classified as drilling with Gulfport up next at 13. Map of whose drilling where as of the Ohio DNR July 27, 2013 report. 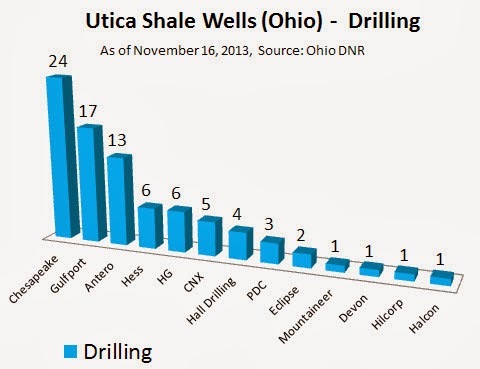 Of the twelve wells classified as "drilling" in the recent May 25th data release provided by the Ohio DNR, Gulfport Energy is seen dominating with five wells drilling. CNX Gas follows with two, and then Anadarko, Hall Drilling, HESS, PDC, and XTO each come in with one each. A map of the wells that are drilling is found here.